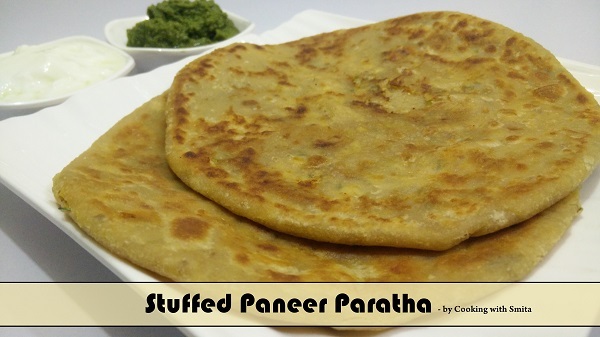 Stuffed Paneer Paratha Recipe – A Delicious & Healthy Punjabi style Paratha stuffed with crumbled spiced Paneer (Cottage Cheese). It is one of the famous Paratha Varieties from Punjab. Paneer Parathas are very easy to make and served as breakfast, lunch or dinner. Learn how to make Paneer Paratha at home with this step-by-step recipe guide. Take a large bowl, add Wheat Flour, Carom Seeds, 1 tsp. Clarified Butter & Salt, mix well. Add water as required and prepare a soft dough. To prepare the stuffing, in another bowl, add grated Paneer and spices – Fresh Coriander, Ginger paste, chopped Green Chillies, Chaat Masala, Garam Masala, Dhana Jeera Masala, Salt, Red Chilli Powder and Onion Powder. Mix well all ingredients and keep aside. After resting for 15 minutes, add some Clarified Butter in the dough and gently knead again. Sprinkle some dry flour on dough ball and roll them into Rotis. Add stuffing in the centre of Roti and wrap it with sides of the circle and seal the edges, give it a round shape like a ball. Press gently, so that stuffing spreads evenly and roll it out gently into thick Paratha. Cook Paratha over the Tawa on medium flame. Flip over partially cooked paratha and apply Ghee on top, spread evenly and flip again. Apply Ghee on another side too and cook till it turns golden brown. Follow the same process and make Parathas from remaining Dough Balls. Serve hot Paneer Paratha with Pickle, Chutney or Curd.